The program is accompanied by a set of 15 audio CD’s absolutely free with a comprehensive program workbook aimed at assisting participants to prepare. The pre-learning and the live program use intensive methods and linguistic re-framing combinations to break down old thinking habits, replacing with the new one leading to a better way of decision making and problem solving. It also guides you to express your emotions and behaviour in a constructive manner to enhance productivity. World class trainers with years of experience behind. 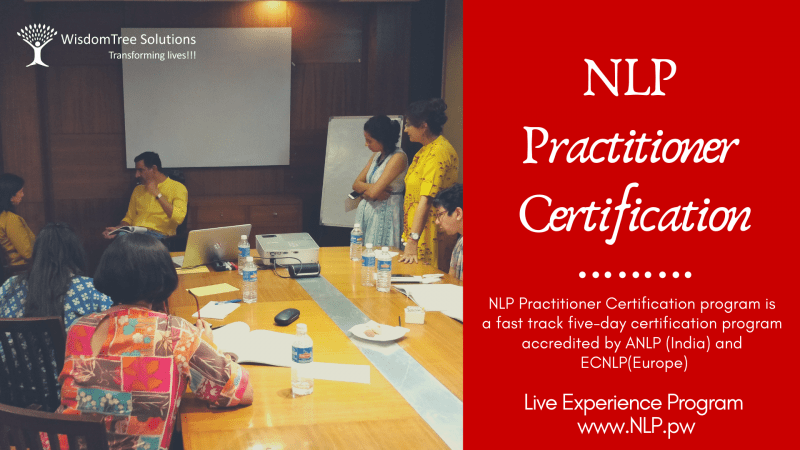 Certificates are recognized from ANLP and ECNLP(Europe) and accepted worldwide. Is complimented with a high-quality workbook to keep you in rhythm even after you graduate. Re-mold your identity, behavior, environment, capabilities, belief system and values and generate a formula of success. Learn to be your own motivator using Anchors. Learn to resolve interpersonal and inter-group rifts using Negotiation. Learn to extract valuable insights from other field of vision and develop leadership qualities.